We were in Callander yesterday :: Picks will be on Flickr soon... It was an absolutely fab day. 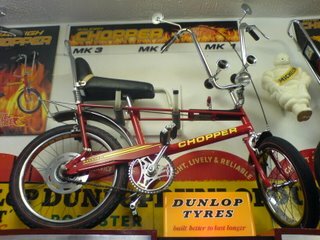 Went to the Toy Museum and fell in love with this Mark 2 Chopper. Super sweet! Turns out the son of the owners renovates/ refreshes old Choppers. I need to make contact with Chris to find out how much he is selling them but I am feeling coveteous! I am going to start a Chopper gang... who is with me? Mine was purple. Check out the picture on my blog.